The ERMI (Environmental Relative Moldiness Index) test is a dust sampling analysis offered by several labs to evaluate the health of a building. ERMI uses a DNA-based method for identifying 36 different species of mold. A smaller version of this test, the HERTSMI (also called the HERTSMI-2), uses similar technology to identify and quantify five of the more common and toxic species of mold. This test is offered by EnviroBiomics ($105-$212) and Mycometrics ($155 + return shipping). All four labs offer vacuum canisters to collect the dust samples, while Mycometrics and EnviroBiomics also offer the option of using a Swiffer-type cloth to obtain the settled dust. momsAWARE offers both the ERMI and HERTSMI tests from Mycometrics. You’ll find both at the momsAWARE Online Store. Keep the following points in mind as you seek to interpret the ERMI test results. All of these have the potential to impact health adversely. For more on the complexity of the indoor environment, see The Biocontaminants and Complexity of Damp Indoor Spaces: More Than What Meets the Eyes. While air sampling, bulk sampling, and tape lifts all have their place, ERMI dust sampling is an excellent tool when evaluating the health of a building in regard to water damage. * An acute and chronic, systemic inflammatory response syndrome acquired following exposure to the interior environment of a water-damaged building with resident toxigenic organisms, including but not limited to fungi, bacteria, actinomycetes, and mycobacteria as well as inflammagens such as endotoxins, beta glucans, hemolysins, proteinases, mannans and possibly spirocyclic drimanes; as well as volatile organic compounds (VOCs). See Surviving Mold’s article What is CIRS? for additional information. Consider the health of the building’s occupants. Are the building’s occupants experiencing health issues? Did these symptoms appear or escalate after moving into the home, school, or office? Are you or your family members experiencing sinus issues, fatigue, brain fog, food sensitivities, or digestive problems? (For a comprehensive list of symptoms, see Symptoms of Biotoxin Illness.) Evaluating the health of the family, yourself, or coworkers is critical when trying to assess the health of a building. If health issues are extreme, this must be taken into account when determining the safety of a building. The ERMI test on the left shows a home that has low levels of contaminants. What is not seen in the excerpt above is the presence of 6800 Spore E./mg of Epicoccum nigrum, an abnormally high number. Epicoccum nigrum is often associated with plant sources, so the homeowner removed all house plants and cleaned the air ducts, deciding to re-test in six months. 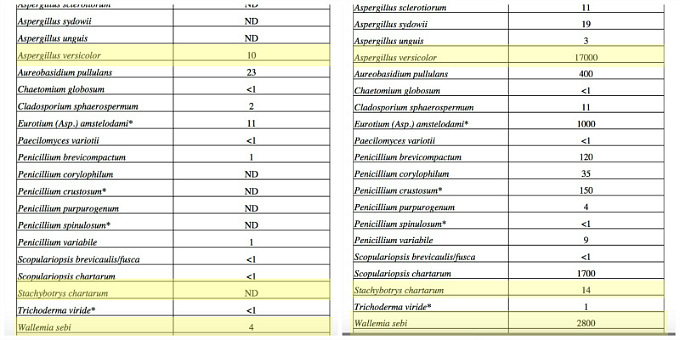 The ERMI test on the right shows a serious mold issue with high levels of critical species, as highlighted in yellow. This homeowner vacated the home, leaving everything behind due to the presence of stachybotrys and serious health issues. For more on decisions regarding possessions, see The Issue of Cross-Contamination. While an ERMI dust sample is often a good first step, there is no one-size-fits-all approach to assessing the health of a building. Take it one step at a time and listen to your instincts as you seek a safe living environment. We just got our ERMI results back… I’d be so thrilled if you could offer your opinion on how concerned we should be! Nobody in our home has been feeling ill – we really just tested out of curiosity, and because there are a few water marks on our bathroom ceiling (roof has been replaced, so it’s not continually leaking). Our HERTSMI score is a 6, if I’m doing the scoring correctly. I’m so confused! Doesn’t seem too bad, but I keep reading that even small numbers in the aspergillus family could mean a major problem. We’re just renting, and plan to leave in the next year. Is it worth it to remediate if we aren’t feeling sick? Our landlord is my dad, and I don’t want to ask him to remediate. So we’d be doing it ourselves. Help!! Thank you in advance so much! Yikes! Our ERMI score is 14.92. We had a mold inspector come out to do a further look and he said that he liked spore traps better and kind of discounted the ERMI as a valid tool. I understand that the ERMI is the history of the home so it could be old mold, but in reading through your site, even old and dead mold is not good, right? He only found one moist spot using a thermal device. I know there’s been extensive damage – the roof has leaked over the last eight years we’ve been here and there’s splotchy looking stains on some drywall, musty smells from electrical sockets (all the areas are dry now). Is it even worth paying more money for spore traps and is remediation even a possibility to make this house safe for my family? Thanks for being such an amazing resource! I think you’re on the right track with your thinking. Remediation may improve things, but does not eradicate the problem. The microbial history stays with the home and for some, that’s enough. For others, a clean environment without the history is optimal. We just received our ERMI fungus test results on our water. We found growths on the bolts in the toilet fill tanks with degradation do the bolts. The local water board was not interested so we sent a sample of the growth for testing. It came back as aspergillius penicilliodes-110. No other molds identified. The same mold come out of our faucets in clumps on an intermittent basis. The research I find doesn’t speak to water colonization of this species and the health impact. The toilet fill tank, etc are not subject to dust, dander, and such from the air in my home. Your expertise appreciated. We will continue to drink bottled water until we hear more! I am stumped on this one, Linda. I would certainly not drink this water and continue to ask questions until you get answers. I was trying to figure out how to get our well water tested for mold. I have CIRS and am familiar with Mycometrics’ ERMIs that I work with my doctor and IEPs on; however, no one as of yet has been able to help me figure out how to test our well water prior to use rebuilding our home at that site. Would you have any experience you’d be willing to share? It looks like you have had some experience. I honestly don’t know, Jamie. Real Time Labs might have an idea, but honestly, I’m unfamiliar with testing water for mold. Hello, I just got some results back too from an ERMI test – a very sensitive member of my family urged me to do it as she feels sick in our house, and around me 🙁 My partner and I feel decent – nothing major, but my dr recommended that I have some labs done to be sure (I have had fatigue, but also confirmed adrenal fatigue, thyroid issues too) So far I just have MSH back – it is low – 11. I just got these back and I am not sure what to think. I know you are just helping people here and can’t help everyone, but if you wouldn’t mind sharing your opinion on my ERMSI labs, I would appreciate it so very much! Well, there are certainly some toxic molds present. This is only a snapshot of the situation, so there is more that needs to be known such as possible source and other health issues. I will email you and we can discuss it further. Hello! I just received my ERMI results from Mycometrics and I am confused as to what I’m looking for number wise. is the “safe” 15 that I’m looking for, for the ‘Group 1-Group 2’ result? Or for the sum of each group, or for each individual fungi?! I have quite a few that are over 15, and some WAY over 15. I have tested positive for Trichothecene mycotoxin, and am trying to figure out if the house is the source. Thank you so much! I can add the numbers for all of them if it is helpful. What a great write up! Thank you so much for sharing this. I am buying a home and did a ERMI dust test through Mycometrics. I just got the results and I THINK they’re pretty good! Using the HERSTMI scoring you suggested I only have 4 points. Am I reading this correctly? If I were buying this home I would want to be sure there is not a source for this – even though the levels are good. Perhaps thermal imaging the home would be a good idea. It’s certainly wise to run a dust sample before buying, but with chaetomium and stachybotrys present, I would want to be sure there isn’t a hidden leak that needs to be properly remediated. The low numbers warrant further investigation as opposed to running from this house…My thoughts anyway, Karla. Thank you for weighing in! I will see if I can get a mold expert to do a little more investigation. The condo is very small, only 500 square feet and the bathroom does NOT have a vent fan. I wonder if that’s the problem. I would be installing one immediately. A bathroom must have proper ventilation. That really could create a mold problem. Trust your instincts, too as you walk around the condo. Although ERMI score is 4.24 🙁 is that bad? I am not sure what to do. I appreciate any advice. I would see if there is a history of water leaks in the home. Perhaps thermal image this home. In this case, you want to be sure there isn’t a hidden issue that will cause problems down the road. I feel so paralyzed and unable to get any solid answers by researching. I have no idea of where to go to understand this intrusive event that has dumped my world and my son, his wife and 5 month son’s world upside down. Wet spot on carpet= secret answers to my declining, severe health last 8 years (?) Hertsmi is 20. The numbers dont seem that bad on all 5 to me but there is no guideline on exact count impacts. I dont think the hertsmi test checks for endoxins or mycotoxins. Should I do a different type of test for those? All my possessions inside being held hostage while I am living in the yard. Do I have to sell, burn, or get to keep? I tested my other home my son, daughter-in-law and 5 month old grandson lives in and it too was a 20. They didnt have all 5 but they had 4 and veriscolor was 1200. We didnt know what to do but flee until we know its safe but I am so desperate for answers and cant find any. Our city is very limited no doctors, remediators who seem to know for sure, insurance denied my claim, I cant afford any remediation. I need to know somehow if my family are in danger. If they can or cannot keep their things. The hertsmi score doesnt say what range is ok for others that haven’t CIRS.That’s confusing. I called Mycometrics and ordered Ermi now but that will be 10days to wait. Thank you for any direction. I’m sorry to hear this. Can you email me directly andrea@it-takes-time.com? If you have those test results I’d like to see them. Hi– If you are still offering help, I would love help interpreting my ERMI. I fully believe my family and I are being affected by mold, but until we found the ERMI, I didn’t know how to figure it out. We can not visibly find any mold, but we have a smell and really high humidity. I just got my ERMI results and while they don’t seem super high, I do have some of the Group I molds. Our Group I sum is 14.38 Our group II sum is 14.33 We have a score of 190 for Aspergillus penicilliodoes. Cladosporium Sphaerospermum is 320, Aureobasidium pullulans is 270. Stachybotrys chartarum says <1. I'm curious why that doesn't say ND. Does this mean they detected some stachybotrys? I have two small children and deeply appreciate any help or direction you can point me in. Happy to help! I emailed you directly or you can email me at andrea@it-takes-time.com. Thank you & blessings for taking the time to help others like this. Well, according to the HERTSMI scoresheet provided at SurvivingMold.com, your score is at least 14, but could be higher as the wallemia came in at 95 and if it were 100 you would add 4 more points. All this to say, there is a mold issue at work, but I have seen much worse. Can you email me directly at andrea@it-takes-time.com? We can strategize a bit more about your situation. Good job getting these tests. I’d really like to see the home results. Hi Andrea – I just sent you an email, hoping you could offer me your thoughts on our test results. You are so kind to be helping all these people figure this stuff out – thank you!! Yes, I sent you an email. Yours is a tough one because it’s borderline. I’m sure you’ll get clarity. Thank you for all this great information. I just bought your book on Amazon to learn more and I emailed you a question. Thanks for educating us! Nice to hear from you, Staley! I messaged you. Please help interpret my results. Are you certain about that chaetomium number? I will email you directly to clarify, Candace. This certainly shows a serious mold problem that could explain any health issues that are occurring. Hi there – I just got the results from my HERSTMI-2 test and ran them through survivingmold.com. I also failed the VCS test. Not sure what my next steps are? I scored a 12 and I’m not sure how bad that is? Thanks so much for any input! Thoughts? Thank you so much. I have Lyme and co infections and trying to figure out what is what. I have previous mold exposure but out of that house now for 6 years. I also run a propolis air diffuser and wonder if that skews the results? Lyme and Mold symptoms mimic each other, but I don't have much in the way of breathing problems. I can upgrade the Hertsmi to Ermi from the cloth I sent in if I let them know within I think 10 days? Is this necessary? It’s so hard to say. Have you had any flooding or water leak in this home? I agree the pen/asp is a bit concerning. It’s hard to know with one test exactly what is happening in the home. An ERMI does give more information, so it could be worth the exchange. Trust your gut on this one, Nancy. It’s true that lyme and mold are similar as both are biotoxins. You’re wise to consider your environment. I’m happy to look over any other results with you. Thank you Andrea, I am looking at re testing. This time doing a carpet sample vs. cloth. Not sure yet what I am going to do yet. Trusting my gut is definitely key. Thank you. Looking for some clarification. Have had many health related issues in the past 5 yrs with all medical testing negative. I was frustrated until I read up on CIRS. My primary dr is doing the Dr Shoemaker protocol with blood testing and am awaiting the results. I sent a sample to lab to have ERM testing done and some of the results are as follows. Is it in my best interest to contact a remediation company to verify air quality and potential clean up of home. Any suggestions are welcomed. Thanks for all of the responses here, reading the above has been very helpful. We have a 1 year old son with significant food intolerances. We came accross mould being a potential cause, and did an ERMI with some worrying levels of some mould species, despite no visible mould in the home. The overall ERMI score was 3.1, with a hermsti-2 of 8. I’d love to get your opinion if I could please email you the full report? Yes, it would be helpful to see the reports, Meg. Email me at andrea@it-takes-time.com. Hi. I just emailed you. Hoping you can provide some guidance. Thanks! Hi ! I am extremely sensitive to mold and biotoxins and recently had to move out of my apartment because it made me sick. Before moving into my new apartment, I did a HERTSMI mold test through Mycometrics and below are the results. I took these results to mean that it was safe to move in, but now I am feeling sick all over again! If I don’t stay there for a few nights, then I feel better, but even staying one night there makes my joints & body hurt, sinuses get congested, and my chest literally burns. What do you think is going on? I’m totally at a loss. Hi Hannah. The HERTSMI is only a snapshot. Your best test is your own body and your gut instincts. The chaetominum suggests there may be more going on than one can see from this one test. It’s so very tough. All indoor environments are compromised to some extent which is why so many do well when camping in some way. Listen to your gut on this, Hannah. I just got my ERMI results back and it seems like I have a high level of mold. I am 27 and was diagnosed with Grave’s Disease and Hyperthyroidism in January. I also now have Thyroid Eye Disease and suffer from all the common hyperthyroid symptoms. I recently found a great functional medicine doctor who discovered many other impalances in my hormones, adrenals, and gut flora. She recommended that I do the ERMI test. Could you tell me if any of these mold species are harmful or could be worsening my condition? Thank you for any input you can give me! Curious about my results: i saw a slide by shoemaker that said ERMI scores under 2 would not create an unsafe HERTSMI…our ERMI was -1.72, but the HERTSMI converts to 16 (barely, ie. Chaetomium globosum is one point over creating the extra 4 points added on?….I am guessing the really high epiccum nigrum (55,000) skews the ERMI score? have you seen Epicoccum nigrum that high? i dont really have indoor plants, but we garden outside, and i have three little boys that are constantly tracking in dirt from our gardens and outside. would you still think this points to water damage? or can just a really dusty house, with dirt ball little kids skew results? 1. Is there a history of a water leak or known water damage? 2. Are there health issues in the home? Sometimes an ERMI doesn’t tell us everything we need to know. So much of this is gut instinct about an indoor environment. so that is where we are kinda confused. We think my issues are from past water damage buildings….there was definite issues in my house growing up and then 4 years ago we lived in a basement for 13 weeks that I am certain is moldy…and I gained 17 pounds in those 13 weeks… i have not gotten any worse in our current house that we have lived in the last 4 years (it was a new build) and we have had zero water problems up to this point and our basement isn’t humid or anything. that being said last week we had our first ever water issue with a pipe below our shower and they are cutting out our ceiling tomorrow…so they may fine something. they are sealing off the area before they cut it open to be cautious. I actually heard a funny pop and then we got a slight bubble in our ceiling right below the shower drain, so thy are pretty certain this has not been a long term issue…I guess we will see…but the ERMI was also taken a week before the event happened. If there has been a leak issue, it could explain some of these numbers on the ERMI. It will be interesting to see. Go with your gut on this home, Jennifer. Indoor plumbing and drywall always have the potential for mold issues, which makes it very tough to find safe homes. Hi there! I just got my ERMI results back today & am completely lost as I am trying to decipher the results. May I e-mail you? We have been living in a house and getting sick..last summer we saw mold growing. We just got our ERMI results back and are just sick about it. We tested the top floor where all the bedrooms are and the basement (finished) I called the lab (Mycometrics) and the tech said he had never seen # as high as ours and that we should get out of the house ASAP! 3rd floor Sum of group 1=61.18 (all 5 of the worst molds present) Sum of group 2 = 24.05 for a total of 37.13. I was confused when looking at the graph, but we are off the charts! Basement Sum of group 1 = 49.81 sum of group 2 = 20.41 for a total of 29.40! I had a stroke 2 years ago and nobody could figure out why. Is there a way to connect our results with our health issues? I have been struggling with health issues for over a year. I had our house tested for mold by a regular company who did some air sampling and checked the walls – they said the house was fine. However, I just recently did an ERMI test which shows there is mold and they said to remediate. Would you be willing to review my results? Sure just email me directly at andrea@it-takes-time.com. If you have copies of the air samples I’d love to see those too. my son has been sick for years following lyme disease and its treatment. We now know from HLA testing and nueroquant MRI that mold is the issue. I had an ERMI done and I am confused. we have mulch/dirt flower beds outside the windows. we sometimes open our windows. Could this be from our garden? Could this be from books and pastel drawings on our walls? or is it likely construction materials? There is no visible sign or smell of mold but obviously something is up as my son feels a little better when he is away from home. It’s always hard to know from one test, but clearly something seems off in this environment. The big red flag to me is the chaetomium. There could be some hidden water damage issue – thermal imaging might help find it. Either way I would trust your mom instincts on this. You were wise to get this test. Wow…I was stunned by how many comments I had to scroll past to leave one of my own! This is a Big Issue, obviously, impacting many. Waiting for our ERMI results. Just mailed in collection cloth yesterday. A “professional” painter water-damaged our 2 -story home 10 years ago by power-washing from the ground up, forcing water up under our wood siding, then his crew promptly sealed in the moisture with paint. We had no idea, at the time, how dangerous this was. Then a roofer completed the job, by installing a roof without proper ventilatation. When it rains, the entire upstairs smells musty. My kids have grown and gone, only me and my husband left. We both have auto-immune issues. My question is, if the test results are high, what do we do with all of our belongings that we will, apparently, be forced to leave behind? The saddest part will be my art journals. Years of funny things the kids would say and do, accomplishments, meaningful moments, including sketches of our daily lives. Years of Bible verses and quotes that helped me, encouraged me, all recorded in journal after journal. Just leave them? I’m overwhelmed. Can you email the test results to me? I’m happy to strategize about this with you. Dear Andrea, Thank you for your great site. I know it takes time, effort and brain work to put together something that is as good as yours. If you are willing, I will send my report via email. Thank You! Just got my ERMI back and I don’t know how to read it. My daughter has Lyme and the “dreaded” HLA DR gene. Any thoughts on our results? There isn’t any kind of interpretation so I’ve been doing online research and found one source that said any sum of 1&2 over 5 is bad, but what does that mean? I would love some advice if you can give me some! I agree that these levels are concerning. According to the HERTSMI score sheet this scores a 14. Anything above 11 is of concern. What is your gut feeling about the safety of this home? I see that you have been busy answering questions about the HERMI and HERTSMI tests. I was hoping that might have time and energy to look at the results of my HERMI test which I just got back today. My history is that I’ve had chronic fatigue syndrome for 9 years. A year ago my house got diagnosed with mold in the basement – lots of Stachybotrys. We got the basement remediated. I started taking cholestyramine. And I started to feel a lot better. BUT not all the way better. I’m concerned that there is still more mold in my house and I don’t know how to interpret the HERMI test. I would be extremely grateful if you could help me figuring how what the HERMI means about my house. The overall score looks good – 6.7. But some numbers seem very high – aspergillum penicilloides is 1200, Wallemia sebi is 1700, and there is a teeny bit of Stachybotrys – 1. And my own lab numbers show that I still have CIRS. I really want to get better. Not sure what to do about my house. If you can give me some advice, I’d be eternally grateful! You are wise to be concerned. I will email you directly. I just got back an ERMI test I ordered off of momsaware. I am at a loss of what to make of the test, although from reading some of your material I know there are some major red flags. (Sum of the Logs (Group I): 33.17, Stachybotrys chartarum 9, Aspergillus versicolor 910, etc) Would you be willing to help me interpret and help me understand if it is vacant-the-property-bad or remediate other ways? Hi, first of all I want to say what an angel you are for taking the time to thoroughly answer and review the numerous problems and concerns people have about mold and mildew. You are truly helping people. My story is sorrbof an in depth one, so ill try to keep it simple and to the point. My boyfriend and 5yr old son live in a condo that we rent from my boyfriends father. He bought the place almost 3.5 yrs ago for us to live in. Upon moving in, the previouys owners remodeled the master bath, and we were the first to actually use the newly remodeled shower. Within the first year of using the shower the grout began cracking on the wall, as well as along the entire bottom of the shower; furthermore, the bottom of the showef wasnt properly made and the water in different areas because it isnt slanted twards the drain. Mildew and a urine smell started to occur within the first year of using the shower. I personally have suffered from a MRSA infection primarily in my sinus’ for 5+ years, and am also highly allergic and sensitive to mold and mildew ( i am also allergic to penecillin.) I made my boyfriend aware of my concerns with the shower when the both visible signs started to appear and I could smell the distinct odor. He didnt take me seriously and so life continued on and norhing was done. Anyways, since that time the visible mildew worsened as well as the odor. Then lawt winter we had really heavy rain, and our chimney leaked… and the leak directly below which was our shower. We literally had water flowing through the wall down our drain inbthe shower like a stream whenever it rained. My boyfriends father had roofers come and they sealed the leak up on the chimney. And thzt was all that was done. I have a bit of knowledge about water damage as i worked for service master clean for a brief period of time, so I know that the the fact that the inside of the wall of our shower was exposed to such high amounts of water and then just left alone is not a good situation. Of course i told my boyfriend and his father my concerns, but they did nothing. About 2 months ago i started experiencing a multitude of health problems that were not symptomatic to my MRSA; furthermore I am practically MRSA free as of January 2017, so the symptoms i was experiencing were alarming. Furthermore, my son and boyfriend as well as myself have had a chronic cough, congestion with thick green nasal discharge and flem, and sneezing. ( sorry for the details.) those are minor to my symptoms- i now have extreme brain fog, difficulty procesSing thoughts, i am dizzy, black out and almost faint, have migraine headaches, skin iflammations, enflammed glands, sharp stomach and abdomen pain, flu- like symptoms, dry eyes, and more- its a new issue every day i feel. And it is not like the symptoms i had from MRSA. I am very sick and need help and guidance on how to get through to my boyfriend and his father. We had a company cole do air testing several months ago, and they basically just emailed the results and said to seal the possible damaged areas in the shower so no further growth can take place, and that was it. Since my symptoms worsened in the last 2 weeks with the extreme heat here in CA, i knew in my gut that i was experiencing the affects of mildew- at the very least. I looked closer at the results last weekend qnd discovered that we had chatomium present, and that worried me. Although the results are low, its been months since this was done; furthermore my boyfriends father did nothing to repair the shower as well. I told my boyfriend and his father my concerns, and we had the insurance company come do testing again two days ago. Results came back negative for black mold… still have not gotten a copy of results yet. Basically I am dealing with the fact that both my boyfriend and his father being unaware that mildew and fungus are toxic just as mold is, and because they are ignorant about this proper measures are not being taken to stop the current problem may we very well have. Can you analize the first results please, and once i get the second results i will send them your way as well? Thank yoo SO much for your time!!! I hope you can help me!!! I am new this mold thing. I have tested positive for the blood tests and genetic mutation and the MarCons. I just got my Hertsmi test back and the aspergillus penicillioides level is 100, the Aspergillus versicolor is 22 and the wallemia sebi is 160. We are selling our house but tested to be sure we didn’t take anything with us. Are the above values anything I should be concerned about while we are here for the next month? Thank you. Can you email the report to me? andrea@it-takes-time.com. Sounds like you’re on the right track with all of this. I am very ill and have definitely been exposed to a lot of mold in the past. I decided to check my current apartment and the ERMI does indicate the presence of mold but I’m not sure how much it could be affecting my health. The area I tested was the bedroom. Any input would be greatly appreciated. 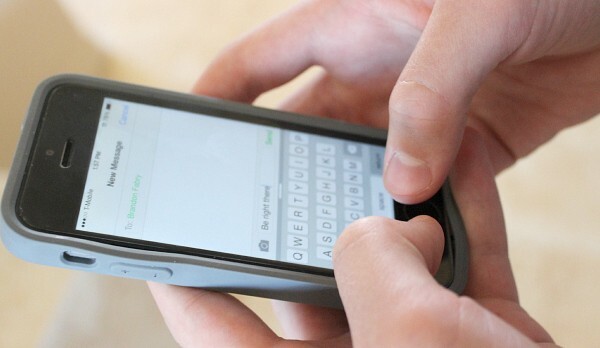 I am in Canada and I don't have long distance phone service. I am going to try buying a phone card to call Mycometrics. I thought a free consult was included but it doesn't seem to say that anywhere (I don't know where I got that info from) and they don't have a 1-800 number. I can’t even begin to explain the air test results. I don’t know what any of this even means and I’m afraid to ask in fear of loosing my job. Should I be concerned with these results and my overall health? Now that I have been exposed to this what would be the long term sides effects, if any? Could I have brought any of these home with me and exposed my family? Those are some high numbers. You are wise to be aware of this. The primary way to gauge this is to monitor your health. And listen to your instincts about this. We just got back our ERMI test from EnviroBiomics and I’m having a hard time understanding it. Would you be able to assist me? Hi, we had a ERMI test in 2016 and I am trying to decide whether to do another one. My daughter’s asthma and hives have been flaring up recently. Any chance you can give me your opinion on the results from before? My understanding is that the mycometrics test allows you to test one floor. We have a basement with open soil exposed. We want to remediate the soil and put a bedroom in the basement but I want to make sure it is safe to have my daughter’s bedroom in the basement. I also have many health issues which include inflammation so it’s possible I am being affected by mold species. My question is; should I just go ahead and test the basement dust and assume anything in the basement is getting upstairs? This is an important question. Yes, you can assume what is going on in the basement will be impacting the entire home. In the field of Building Biology, basements are not recommended for sleeping areas, simply because of the lack of sunlight and proper ventilation. Basements are a magnet for dampness and therefore potential mold issues. Great question. Hi, I just got my ERMI test back that I did for 3 floors in my house. I calculated using the HERTSMI calculation a 14, 12 and 28. I am symptomatic. Are these levels safe? There is no visible mold. How do I go about finding the source. Is it hopeless since mold is showing up on all 3 levels? bleeds. I have my test done by envirobiomics can I please email you it. I just don’t understand is the mold causing all these crazy symptoms? Because I feel crazy and doctors really don’t think they are in anyway related! 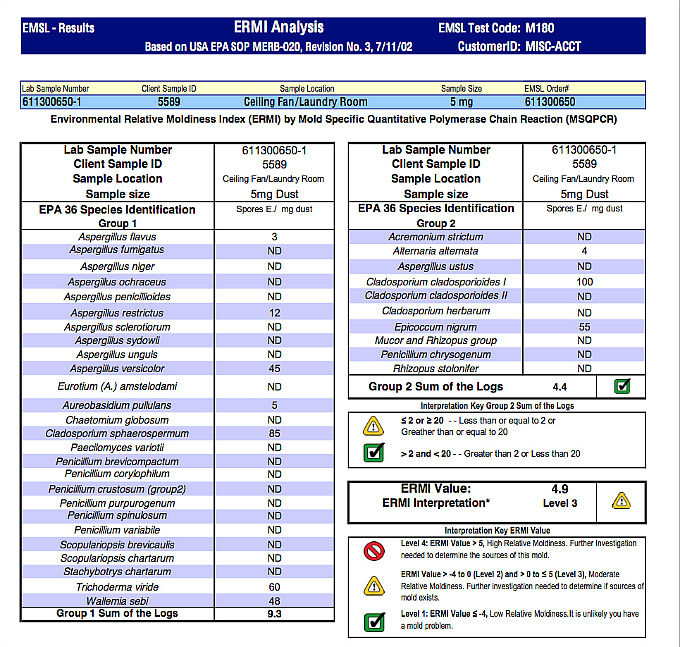 what’s your thoughts on ERMI testing sampled from carpet? The mold testing company did take air samples, looked for moisture areas and ERMI test on the kids rooms carpet (used their vacuum) . The HERSTMI-2 test is unfortunately – 20 🙁 My doc suggested getting rid of carpets and cleaning house (which we just did). I myself have Mast cell activation, my 3 yr old son has allergies (including mold) and my 5 yr old daughter has celiac disease. We are currently testing myself and my son for mold in our bodies (waiting on results). (we both have hla dr multisuceptile gene). Refrigerator coils, ceiling fans or other places of settled dust are preferable. Feel free to send your HERTSMI report to me at andrea@it-takes-time.com. It sounds like you have found a connection between these health issues and your home. Hi! I recently had my daughter’s room tested for mold using a dust sample from Mycometrics labs. I didn’t realize that they didn’t also interpret the results and I’m at a loss to know what to do next. Do you still provide help? My daughter (whose room was tested) and her cousin both get allergy symptoms when sleeping in that her room. I would really appreciate any insight on this! I have a history of CIRS from a moldy office and my symptoms are returning. I also have 5 children and a husband who all have various symptoms of mold illness, but could also be explained by other medical illnesses. the Inspector stated the house has some MOLD ISSUES founded in the Unfinished very humid moist Basement. the email report copy went over to our broker and we got a copy also. here are a bunch of numbers – can you plz tell me what it means? I would be very concerned and would consider walking away from this. Remember that you’re the expert when it comes to your home and you can trust your instincts. Most “experts” downplay the problem and certainly are not trained in the health effects of mold. You are such a blessing to people! Thank you for this kind service. Your site has given me a lot of information and hope. I have been VERY sick for about 3 years with a lot of seemingly mold exposure related symptoms. Comparing my results to others I am finding myself at a loss as to whether this is the answer to my health issues or not. I was wondering if you might provide some insight. Just to add quickly, my husband and I both have coughs, red eyes, and rashes. I have developed hormonal issues, vaginal pains, extreme brain fog, high blood pressure, tinnitus, vertical ridges on all nails toes and fingers, and we have both had swollen glands for years now.. among many other symptoms. I forgot to mention, as I should have that we did have a water damage incident we were informed of before moving into the home. The bathroom was flooded. There seems to be more going on in this home than this one test may show. Our homes are complex structures and if there is a history of water damage and health issues, then you can be assured the two are related. I would trust your gut on what is needed at this point. I have a feeling this test isn’t giving us the full picture. Andrea, I cannot thank you enough for your response! I am feeling quite overwhelmed as to what to do next. My father in law who owns the home doesn’t seem to think there is a mold issue based on our ERMI report as most molds are ‘within normal range’. Do you have any advise as to what my next step should be? My husband will not leave the home with me and still waffles on whether he believes the health issues and home are connected. My father in law doesn’t wish to look into remediation unless the visible mold returns. He wants us to have the home deep cleaned and thinks that will solve the issue. About a month ago, we did find visible mold on our bedroom window blinds and unfortunately decided to toss the blinds and then wipe down the windowsill with bleach ourselves as we did not understand how serious this issue could be at the time.Our bedroom smelled like mold for two-three days afterward. My husband and I both had some weird symptoms pop up almost immediately after cleaning (vertigo and headache for me and my husband complained of headache and then slept for 4 hours immediately after having woken up, not like him). Our intake duct is very dirty and we plan to have it cleaned. My understanding from further investigation is that I should retest and test for mycotoxins. Do you agree with this? I also plan on getting a moisture meter and checking around the home. We have had a home inspector come and look at the home and he says that there is no evidence of mold overgrowth! ALL he did was walk around a LOOK at the house. He did not get to see the black colored mold on the blinds as we had cleaned them. One last thing, our ceiling in our living room (which is directly under the bathroom that flooded) creaks and pops regularly and our home is not very old. There is a couple of bubbled looking spots as well.. the inspector said this was not of concern because he poked the bubbles and they were hard and not wet.. I am so grateful for the support this community offers.. It is frustrating feeling like I am being sloughed off and not taken seriously while my body is clearly telling me something is very wrong.. having this site as a resource offers comfort knowing that we are not alone in this! Thank you again so much for your fast response and the genuine kindness you display. One more thing of importance I really would like some advise on, I took the VCF test and PASSED. My vision rapidly became very blurry and I have floaters as well no previous history of vision problems. Does this mean that I should rule out mycotoxin exposure being the reason for my health issues? Also, I heard a Dr. saying that usually patients with indicators of mold toxicity will have normal labs in other tests that are usually done; including CRP a general inflammation marker.. mine is high at 10.2. I am honestly nervous about putting so much time, energy, and money into testing the home so thoroughly for mold when certain other tests may be indicating this is not the reason for the problem. Thank you again and I do apologize for the lengthy messages! This is a tough one, Sierra. I go on gut instincts more than anything and there sounds like there is something off with this house. What this exactly means I don’t know. But finding mold growth on the blinds and these ceiling spots are very concerning. Some of our labs were normal and we were impacted severely. Andrea, Can I email you my EMRI report and additional information. I’d like your feedback concerning the report and our home. Thank You. My understanding is that, on the spectrum of moldy houses, this is not too bad. Nonetheless, I am very concerned that my daughter has been living with black mold around. Are these levels dangerous for a baby to have spent her gestation and first year of life in? We are moving out, but I feel a need to understand the exposure she’s already incurred. Thank you for any support with interpreting these results. I am having a hard time finding much info on infants. I’m glad to hear you’re moving out. You’re on the right track with this. A clean environment is a “treatment” so rest assured you are doing all you can for your daughter. You will want to be cautious with your belongings as I’m sure you already know. Especially bedding and clothing for her. Good job making this connection! Thank you Andrea. Is your sense that these levels are dangerous for a baby to have been living in? And as for bedding and clothing, would you suggest we toss her mattress? 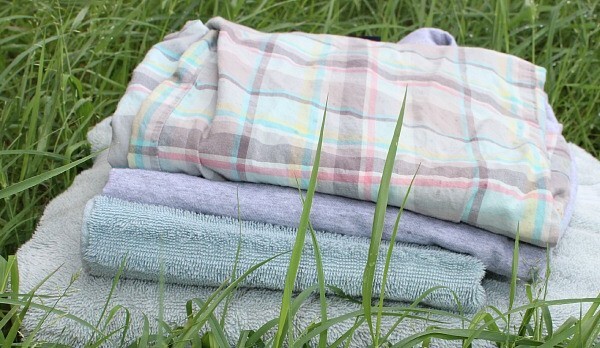 Can mold spores be eradicated from bedding and clothing via washing? Thank you so much! It’s really hard to find sound support around this topic! Perhaps I’ll also add that I don’t really know about how to be cautious with our belongings. So, any links or tips would be appreciated. Thank you again. The score is 14 which is “boderline”. I havn’t seen any visible mold, although there was water damage decades ago. The other consideration is an old wood floor. The humidity is very low and temperatures are fairly low as I am in Denver. I just ordered an air filter that filters down to .003 microns and will clean my bedroom with vinegar. Is this sufficient or should I move out immediatly? I honestly don’t know. There is clearly a mold issue in the home. It depends on the health of the occupants. If everyone is healthy, then an air purifier may be enough. I would trust your instincts on what is needed. I just got my ERMI results and am totally confused. I am having tons of health issues so I am curious if the molds are the source. Could I email them to you and get your opinion? Hello Andrea! I am so so so thankful for your website!! I just received my HERTSMI score and emailed you in hopes you can help advise me on the seriousness it all. Thank you so much for all you do with this website and advising people! Thank you so much for answering so many questions, there is so little information on ERMI interpretation out there. I am confused as to why in the ERMI test they minus group 2- from group 1 to get the score. I have now done 4 different tests for different houses and some of the tests seem to have a higher overall spore count, but the ERMI score is lower than a house which seems to have less overall spore count because the difference between group 1 and 2 is lower. Am I looking at it right? Also, I am having such a hard time finding a low ERMI even in brand new studios in coastal Northern California. After looking everywhere, I have a brand new never been lived-in studio option that is coming back with an ERMI of 14 and a HERMSI of 10. I assume I should not move into it for detox and the “house arrest” my doctor wants me to do. Even though I really don’t want to, I’m feeling like I might need to move out of state at least for the detox, I feel like I’m completely reactionary to my town and feel consistently better when I am in other places. Or maybe I can really clean the new unit and it will work? Any thoughts are appreciated! I’m not sure I can answer this. Perhaps contact the company that issues the test to get an answer. The ERMI is only part of the picture. No environment is perfect. How do you feel in the place? What is your gut instinct? I encourage you to follow your heart on what is best for you. Can I email you my Ermi results to get your opinion? Hi, we just received our ERMI results and are very concerned given that a family member has the dreaded HLA gene and also has chronic Lyme and co-infections. We live in South Florida and wonder if our ERMI results are typical of homes down here. This highlights: The Apergillus penicillioides is 1500, aspergillosis versicolor is 450 and Wallemia sebi is 150. The sum of the Logs Group I is 22.49. The sum of the Logs Group Ii is 7.82. Another room Hausa sum of the Logs Group I of 29.45 and Sum of the Logs of10.64. Hi Andrea! I tried posting last night in regards to our ERMI score of 14.92, but I don’t think it’s going through. I would love to send you my report and would be grateful for your opinion. We are renters and a house has come up that we could move to (the rental market where we live has limited inventory). Our landlord may remediate but I’m concerned about how effective this will be given our high score and my family has some health issues in line with the symptoms listed for mold exposure. We are starting testing next week with our doctor so those results won’t come in before we have to make a decision as to move or stay. I love how your message is to trust your gut, and I’m really trying to do that, but uprooting everything is an overwhelming decision! Many thanks! We got an ERmI test and HERSTMI-2 back today and both came in at 12. Our house is over 90 years old and we had air testing done 7 years ago after my boys both had very long coughs and we were told the tests were in normal range and that they could find no wet areas, but said there had been past leaks which seemed to have been addressed. At the time, I didn’t know about ERMI and just paid for air tests and then felt better. I recently have had another episode where a couple kids have had a ridiculously long cough. We eat really clean, gfcf diets so I don’t think they are reacting to food. I’ve since learned about ERMI and felt like I had to rule it out. Is a 12 indicative of a current issue? I’m nervous to open anything up and don’t really feel like I know how to find someone who I would really trust to investigate and remediate. We have no odor in our home that anyone can detect , but I notice it in other places that I sometimes walk in to. Would you mind giving me guidance? We live in Southern California. We received ERMI testing for my daughter’s assigned dorm next year. Group 1=27.58 (with high scores of 28,000 in Cladosporium sphacrospermum and high scores in various penicillodes varieties). Group 2=18.16 with highest score being 53,000 /dkadisoiruuyn ckadisporiodes 1) ERMI TOTAL =9.42. This daughter has had severe toxic mold exposure and has been home schooled 3 different school years. She is truly the canary in the coal mine. We have taken this test to try to persuade the college that this newly renovated space is not acceptable for her despite the fact that they have told her it is and she needs to take it. This child does not smell mold easily (surprisingly), but she smells it as soon as walking in. Clearly, it is unacceptable. In scoring on the HERTSMI sheet, the lowest assignable number for stachybotrus is for findings of 5-24. The ERMI reflects findings of 2 stachybotrus. Additionally, I am concerned that some of the higher numbers above are not included on the HERTSMI. How would you score the 2 counts of stacybotrus? Our biggest battle is in fighting the school. After 10 years of this, you would think we would have figured it out. As a sophomore she is prohibited to live off campus (we considered buying a lot and building a container house). There is one new, climate controlled dorm which she lived in this year. The school refuses to allow anyone to live there more than one year. It is an old school in the wet midwest and none of the other dorms are really acceptable. My daughter wants to fight this on her own. I would like to meet with the President and propose an off-campus option. How would you fight this? What findings would you share? Of course, this has become urgent. Can you send me the full ERMI report? andrea@it-takes-time.com My thought is that when our kids are this age it is good to allow them to advocate for themselves. Fighting these issues can be very draining for us as moms. But trust your instincts on what is best.